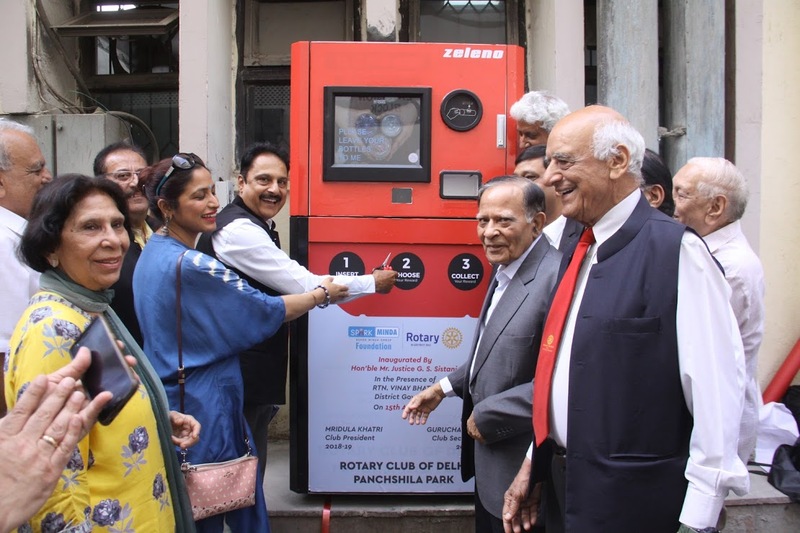 16th April 2019, Jaipur: Spark Minda Foundation (SMF) in collaboration with Rotary club, Panchshila Park, Delhi has set a milestone in societal development by installing the most unique waste recycling machine in Delhi High Court. The installation is the part of Spark Minda Foundation’s CSR initiative to curb plastic pollution in the city and promote sustainable development. A reverse vending machine has been installed near to honorable justice’s office where in anyone can drop in the plastic bottle and in turn vending machine will reward disposer with one rupee or cash coupon for each bottle. The inauguration of vending machine has been done by honorable Mr. GS Sistani, Justice, High Court Delhi; in presence of Mr. MK Pajan, Advisor SMF and Mr. AP Gandhi, Director, Minda Corporation Limited who have been actively involved in putting up the vending machine in the High Court premises. One of its kind vending machine is capable of disposing and recycling Plastic Bottles, Aluminum, or steel cans. Spark Minda Foundation has been enthusiastically participating in one of the most innovative ways of community up gradation and transformation. Installing of such vending machine will give a direct access to everyone in that surrounding to dispose the plastic waste in the most innovative way. This is one of the first machine being installed by Spark Minda Foundation in Delhi High Court, moreover foundation will plan and put up some more such machines in future at different places. Rotary Foundation/Club has been solving some of the crucial societal issues for more than 110 years now. The group has been taking much needed actions against most persistent issues like fighting disease, providing clean water and support education and hygiene. Setting up of waste disposable machine in high court is a collaborative step ahead for both the organizations to promote sustainability. Spark Minda Group has been involved in Community Development initiatives since decades. In continuation to the legacy of a responsible corporate citizenship, the CSR activities being taken at the group are derived from the triple bottom line model of People, Planet and Profit. Ensuring environment sustainability with community care are the thematic divisions, surrounding which the CSR activities are planned and executed across the Group. Community is always a stakeholder for both directly implemented and collaborative projects. Guided from the Millennium Development Goal and CSR under Companies Act 2013, Education; Vocational Training and Livelihood promotion; Health and Sanitation; support to differently abled; Environment Sustainability and Women Empowerment are current broader head of intervention across the Group. To implement the CSR projects, the Group has established Spark Minda Foundation was incorporated u/s 8 of the Companies Act, 2013 and is a 100% subsidiary of Minda Corporation Limited (a leading automotive component & flagship company of Spark Minda).